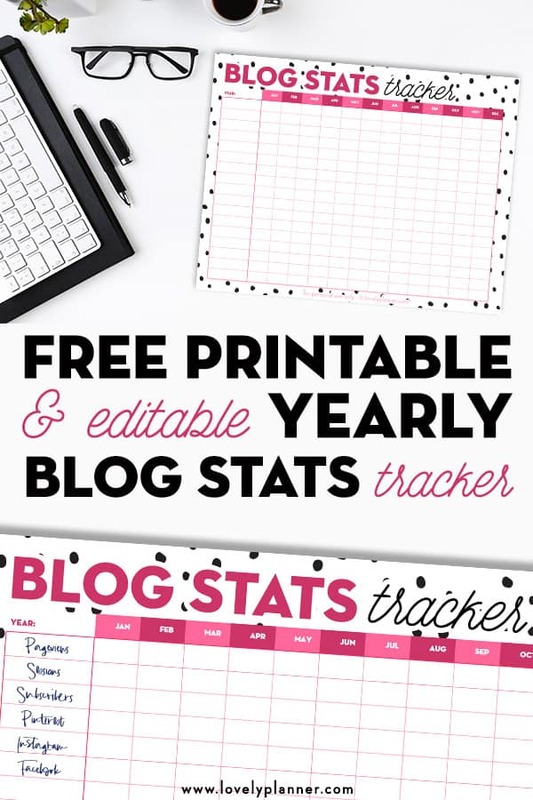 I’m happy to share with you this free printable blog stats tracker that will help you keep track of your blog stats month after month, all year around. 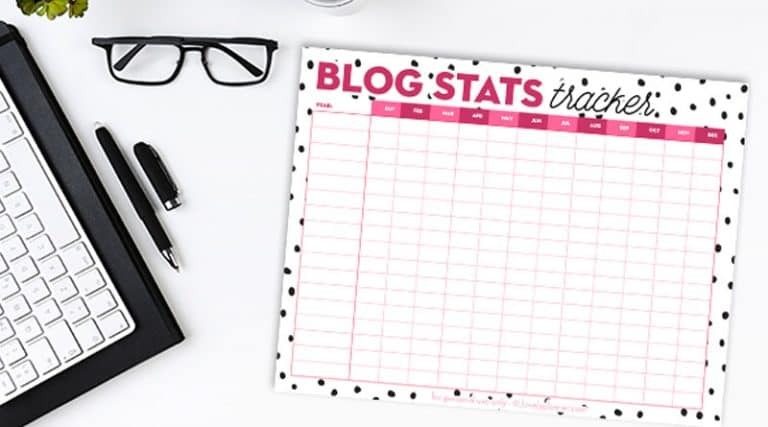 Each blogger is different and so you might want to track different stats and elements depending on your blog and your way of doing things. Which is why I thought it would be nice to leave this printable blank, and include an editable version, so that you can type in (or write in) all the stats you’d like to track in the first column instead of sharing with you a pre-filled printable that might not fit your situation (for example, if you don’t use twitter, you don’t need nor want to have a line with that stat to record in your table). Budget: Income, Expenses, Profit, Ad Income, Affiliate Income, Ad expense, Product sale, etc. 1 Editable PDF – The first column (with elements to track) is editable, which means you can type in the elements you want to track before printing to get a printable that fits your needs! I typed in suggestions of elements to track, you can modify them, delete them, add some, etc. You’ll need Adobe Acrobat Reader to be able to edit this file, and I’m including a document with explanations on how to change font, size, etc. Even if you’re not very tech savvy you should be ok.
13 columns: you write the element you’re tracking in the first column, and you add in the stat in the 12 other columns each month, for the 12 months of the year. 17 rows: you can track as much as 17 elements to track your blog progression, so you can be as thorough as you’d like. However you can of course keep things simple and track less elements if you’d like. You can download this printable further down this page but first I’d like to share some exciting news with you! I’m deciding to share this free printable today specifically because it’s the first day of the 2018 Genius Blogger’s toolkit sale. This bundle will only be available for 6 days (october 10 to october 15) so make sure to check it out very soon! This bundle includes 77 trainings: over $5,860 worth of products at a 98% discount.